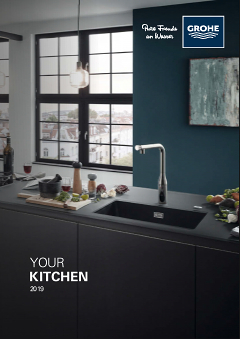 GROHE Blue turns ordinary tap water into a pure, soft table water that is perfectly safe to drink and has a wonderful taste optimized by the smart filter technology. GROHE Blue water not only tastes great by itself – you will also notice that it gives your tea and coffee a richer and more refined flavor. With lime filtered out of the water, it is ideal for home appliances like kettles, egg cookers, coffee machines and irons. With its 5-phase filter technology, the GROHE Blue filter purifies your tap water, giving it a fresh refined taste. As water passes through the filter, undesirable substances such as chlorine that could cause odor or affect its taste are removed. The fine particulate filter retains even the tiniest particles, leaving nothing but pure water with a great fresh taste. The filter also extracts heavy metals and reduces the lime content of the water significantly. Changing the water filter is quick and hassle-free, ensuring a reliable supply of fresh, lime-free water straight from your tap. The GROHE Blue Duo tap delivers both ordinary tap water and pure filtered water with a great fresh taste. To guarantee perfect purity, separate inner water ways ensure the normal tap water and filtered water never come into contact. Replacing your regular tap with this innovative and efficient model will be super easy and hassle-free. Its high spout is perfect for filling tall carafes.